In Spain, Germany, Italy, and Holland. A high school; a rabbinical college. It is the oldest institution of Jewish learning, and ranks higher than the Ḥeder or the Talmud Torah. The term "yeshibah" and the Aramaic equivalent "metibta" (both found in the Talmud) originally meant a session, a council, or a meeting of scholars, over which presided the "elder." The Patriarchs were all elders of a yeshibah (Yoma 28b). R. Pappa was elected "rosh yeshibah" (or "resh metibta"), i.e., president of the yeshibah, and it was his duty to deliver a lecture and discussion before the yeshibah of a large and mixed assembly (Ber. 57a and Rashi ad loc. ; B. Ḳ. 117a). At first the bet ha-midrash was the place where the yeshibah assembled, one or two (morning and afternoon) sessions being held daily. Later, when the number of students increased, it became necessary to hold the sessions in a separate large hall adjoining the bet ha-midrash, and this hall was known by the name of "yeshibah." The general term for the lecture was probably "pesiḳta" or "mekilta," which, like the modern term "shi'ur," means "measure," indicating the fixed and limited time occupied by the rosh yeshibah in delivering the discourse—from two to three hours. During the Talmudic period the principal Palestinian yeshibot were at Sepphoris, Tiberias, and Cæsarea, while the leading Babylonian ones were at Maḥuza, Nehardea, Sura, and Pumbedita. Those at the last two towns were maintained in the geonic period (see Academies). The principal seat of the Rabbis after the days of the Second Temple was Pumbedita ("Iggeret Rab Sherira Gaon," ed. Goldberg, p. 32, Mayence, 1873). The attendance at the Babylonian yeshibot gradually decreased. Rab had 1,200 students at his yeshibah; R. Huna had 800 students, with 13 amoraim as interpreters; Rabbah and R. Joseph each had 400; and R. Ashi had only 200 (Ket. 106a). The sessions of the Babylonian yeshibot were interrupted on several occasions, and were finally suspended by the Persian persecutions, the last being held at Bagdad. Benjamin of Tudela (1160-73) found ten yeshibot there, and he enumerates the names of every rosh yeshibah, the principal one being R. Samuel b. Eli. The "rosh ha-golah" (president of the Captivity) bestowed "semikah" (ordination) upon the graduates of the yeshibah (Benjamin of Tudela, "Itinerary," ed. Asher, p. 60, London, 1840). 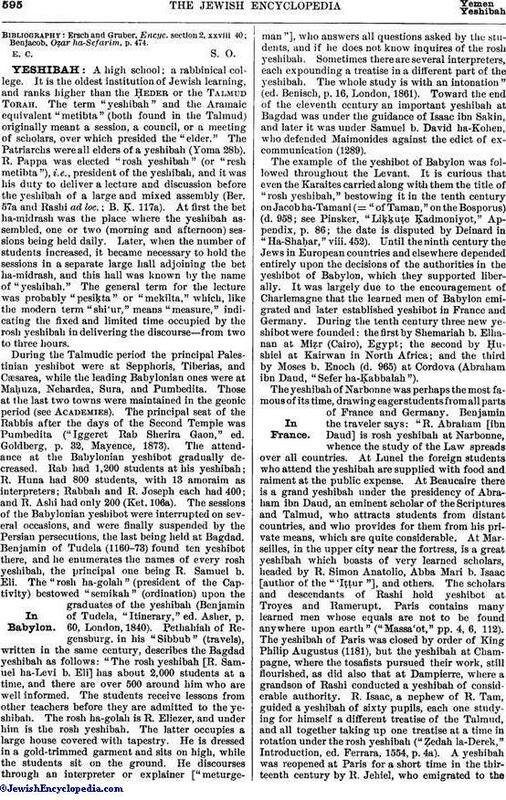 Pethahiah of Regensburg, in his "Sibbub" (travels), written in the same century, describes the Bagdad yeshibah as follows: "The rosh yeshibah [R. Samuel ha-Levi b. Eli] has about 2,000 students at a time, and there are over 500 around him who are well informed. The students receive lessons from other teachers before they are admitted to the yeshibah. The rosh ha-golah is R. Eliezer, and under him is the rosh yeshibah. The latter occupies a large house covered with tapestry. He is dressed in a gold-trimmed garment and sits on high, while the students sit on the ground. He discourses through an interpreter or explainer ["meturgeman"], who answers all questions asked by the students, and if he does not know inquires of the rosh yeshibah. Sometimes there are several interpreters, each expounding a treatise in a different part of the yeshibah. The whole study is with an intonation" (ed. Benisch, p. 16, London, 1861). Toward the end of the eleventh century an important yeshibah at Bagdad was under the guidance of Isaac ibn Sakin, and later it was under Samuel b. David ha-Kohen, who defended Maimonides against the edict of excommunication (1289). The example of the yeshibot of Babylon was followed throughout the Levant. It is curious that even the Karaites carried along with them the title of "rosh yeshibah," bestowing it in the tenth century on Jacob ha-Tamani (= "of Taman," on the Bosporus) (d. 958; see Pinsker, "Liḳḳuṭe Ḳadmoniyot," Appendix, p. 86; the date is disputed by Deinard in "Ha-Shaḥar," viii. 452). Until the ninth century the Jews in European countries and elsewhere depended entirely upon the decisions of the authorities in the yeshibot of Babylon, which they supported liberally. It was largely due to the encouragement of Charlemagne that the learned men of Babylon emigrated and later established yeshibot in France and Germany. During the tenth century three new yeshibot were founded: the first by Shemariah b. Elhanan at Miẓr (Cairo), Egypt; the second by Ḥushiel at Kairwan in North Africa; and the third by Moses b. Enoch (d. 965) at Cordova (Abraham ibn Daud, "Sefer ha-Ḳabbalah"). The yeshibah of Narbonne was perhaps the most famous of its time, drawing eager students from all parts of France and Germany. Benjamin the traveler says: "R. Abraham [ibn Daud] is rosh yeshibah at Narbonne, whence the study of the Law spreads over all countries. At Lunel the foreign students who attend the yeshibah are supplied with food and raiment at the public expense. At Beaucaire there is a grand yeshibah under the presidency of Abraham ibn Daud, an eminent scholar of the Scriptures and Talmud, who attracts students from distant countries, and who provides for them from his private means, which are quite considerable. At Marseilles, in the upper city near the fortress, is a great yeshibah which boasts of very learned scholars, headed by R. Simon Anatolio, Abba Mari b. Isaac [author of the "'Iṭṭur"], and others. The scholars and descendants of Rashi hold yeshibot at Troyes and Ramerupt. Paris contains many learned men whose equals are not to be found anywhere upon earth" ("Massa'ot," pp. 4, 6, 112). The yeshibah of Paris was closed by order of King Philip Augustus (1181), but the yeshibah at Champagne, where the tosafists pursued their work, still flourished, as did also that at Dampierre, where a grandson of Rashi conducted a yeshibah of considerable authority. R. Isaac, a nephew of R. Tam, guided a yeshibah of sixty pupils, each one studying for himself a different treatise of the Talmud, and all together taking up one treatise at a time in rotation under the rosh yeshibah ("Ẓedah la-Derek," Introduction, ed. Ferrara, 1554, p. 4a). A yeshibah was reopened at Paris for a short time in the thirteenth century by R. Jehiel, who emigrated to theHoly Land. Mattithiah b. Joseph of Provence reestablished a yeshibah at Paris in the fourteenth century, and Jacob of Orleans (d. 1189), a pupil of R. Tam, crossed the Channel and opened a yeshibah in London. The first yeshibah in Spain was established at Cordova, and attracted the scholars of the Levant. Later were founded the yeshibah of Granada and that of Lucena, the latter being successively conducted by Isaac Alfasi (1090) and his pupil Ibn Migash. These examples were followed by Jehiel ben Asher at Toledo, where he changed the whole tone of Spanish Judaism; by Solomon ben Adret at Barcelona in 1305; and by R. Nissim at the same city in 1372. R. Gershom (960-1028) emigrated from France to Mayence, where he founded a yeshibah and gathered many students from Germany and Italy. This yeshibah flourished for more than eighty years and became a center of Talmudic activity. Joseph Colon (1420-80), the author of a collection of responsa, had a yeshibah at Pavia, Italy; and Judah Minz of Mayence founded a yeshibah at Padua (1504-26). 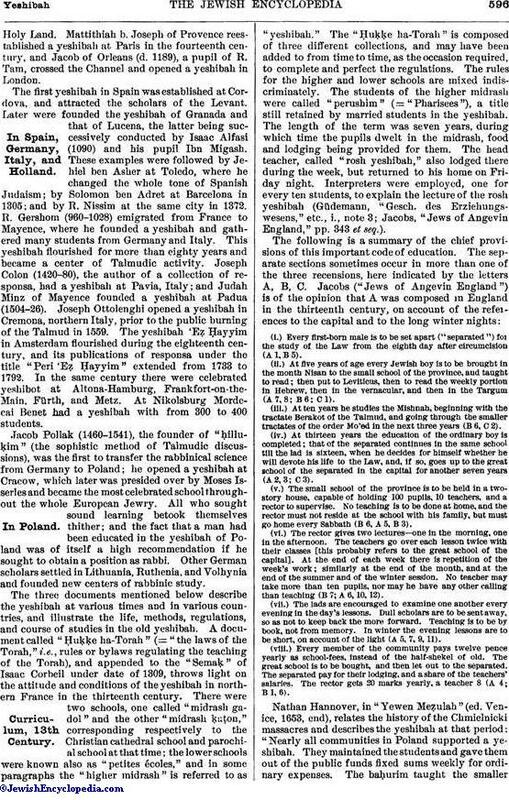 Joseph Ottolenghi opened a yeshibah in Cremona, northern Italy, prior to the public burning of the Talmud in 1559. The yeshibah 'Eẓ Ḥayyim in Amsterdam flourished during the eighteenth century, and its publications of responsa under the title "Peri 'Eẓ Ḥayyim" extended from 1733 to 1792. In the same century there were celebrated yeshibot at Altona-Hamburg, Frankfort-on-the-Main, Fürth, and Metz. At Nikolsburg Mordecai Benet had a yeshibah with from 300 to 400 students. Jacob Pollak (1460-1541), the founder of "ḥilluḳim" (the sophistic method of Talmudic discussions), was the first to transfer the rabbinical science from Germany to Poland; he opened a yeshibah at Cracow, which later was presided over by Moses Isserles and became the most celebrated school throughout the whole European Jewry. All who sought sound learning betook themselves thither; and the fact that a man had been educated in the yeshibah of Poland was of itself a high recommendation if he sought to obtain a position as rabbi. Other German scholars settled in Lithuania, Ruthenia, and Volhynia and founded new centers of rabbinic study. The three documents mentioned below describe the yeshibah at various times and in various countries, and illustrate the life, methods, regulations, and course of studies in the old yeshibah. A document called "Ḥuḳḳe ha-Torah" (= "the laws of the Torah," i.e., rules or bylaws regulating the teaching of the Torah), and appended to the "Semaḳ" of Isaac Corbeil under date of 1309, throws light on the attitude and conditions of the yeshibah in northern France in the thirteenth century. There were two schools, one called "midrash gadol" and the other "midrash ḳaṭon," corresponding respectively to the Christian cathedral school and parochial school at that time; the lower schools were known also as "petites écoles," and in some paragraphs the "higher midrash" is referred to as "yeshibah." The "Ḥuḳḳe ha-Torah" is composed of three different collections, and may have been added to from time to time, as the occasion required, to complete and perfect the regulations. The rules for the higher and lower schools are mixed indiscriminately. The students of the higher midrash were called "perushim" (= "Pharisees"), a title still retained by married students in the yeshibah. The length of the term was seven years, during which time the pupils dwelt in the midrash, food and lodging being provided for them. The head teacher, called "rosh yeshibah," also lodged there during the week, but returned to his home on Friday night. Interpreters were employed, one for every ten students, to explain the lecture of the rosh yeshibah (Güdemann, "Gesch. des Erziehungswesens," etc., i., note 3; Jacobs, "Jews of Angevin England," pp. 343 et seq.). (i.) Every first-born male is to be set apart ("separated") for the study of the Law from the eighth day after circumcision (A 1, B 5). (ii.) At five years of age every Jewish boy is to be brought in the month Nisan to the small school of the province, and taught to read; then put to Leviticus, then to read the weekly portion in Hebrew, then in the vernacular, and then in the Targum (A 7, 8; B 6; C 1). (iii.) At ten years he studies the Mishnah, beginning with the tractate Berakot of the Talmud, and going through the smaller tractates of the order Mo'ed in the next three years (B 6, C 2). (iv.) At thirteen years the education of the ordinary boy is completed; that of the separated continues in the same school till the lad is sixteen, when he decides for himself whether he will devote his life to the Law, and, if so, goes up to the great school of the separated in the capital for another seven years (A 2, 3; C 3). (v.) The small school of the province is to be held in a two-story house, capable of holding 100 pupils, 10 teachers, and a rector to supervise. No teaching is to be done at home, and the rector must not reside at the school with his family, but must go home every Sabbath (B 6, A 5, B 3). (vi.) The rector gives two lectures—one in the morning, one in the afternoon. The teachers go over each lesson twice with their classes [this probably refers to the great school of the capital]. At the end of each week there is repetition of the week's work; similarly at the end of the month, and at the end of the summer and of the winter session. No teacher may take more than ten pupils, nor may he have any other calling than teaching (B 7; A 6, 10, 12). (vii.) The lads are encouraged to examine one another every evening in the day's lessons. Dull scholars are to be sent away, so as not to keep back the more forward. Teaching is to be by book, not from memory. In winter the evening lessons are to be short, on account of the light (A 5, 7, 9, 11). (viii.) Every member of the community pays twelve pence yearly as school-fees, instead of the half-shekel of old. The great school is to be bought, and then let out to the separated. The separated pay for their lodging, and a share of the teachers' salaries. The rector gets 20 marks yearly, a teacher 8 (A 4; B 1, 6). Nathan Hannover, in "Yewen Meẓulah" (ed. Venice, 1653, end), relates the history of the Chmielnicki massacres and describes the yeshibah at that period: "Nearly all communities in Poland supported a yeshibah. They maintained the students and gave them out of the public funds fixed sums weekly for ordinary expenses. The baḥurim taught the smallerboys. A community consisting of fifty 'ba'ale battim' [= "householders"] supported about thirty students. In addition to receiving fixed stipends the students were invited as guests to the tables of the community, every household having invariably one or more such guests from the yeshibah. Consequently the number of ḥakamim increased to such an extent that very often there were found twenty ḥakamim bearing the title of 'morenu' or 'ḥaber' in a community of fifty householders. The rosh yeshibah was above all in rank. The terms of study were as follows: in summer from the 1st of Iyyar to the 15th of Ab, and in winter from the 1st of Ḥeshwan to the 15th of Ṭebet, the intervals being devoted to private studies. In the first part of each season, namely, from the 1st of Iyyar to Pentecost, and from the 1st of Ḥeshwan to Ḥanukkah, the studies in the yeshibah consisted of Gemara with Rashi and tosafot, one page daily. This was called one halakah. The rosh yeshibah sat on a chair, and the students stood around him. The students prepared themselves beforehand by carefully studying the halakah of the day, and then asked the rosh yeshibah to explain the difficult passages. After he had answered, all kept silence, and he then discussed a 'ḥilluḳ,' a pilpulistic review of the halakah in detail. This lasted till noon or a little later. The second half of the term was devoted to the study of Alfasi and the poseḳim [decisions and codes], particularly the four volumes of the Ṭurim with commentaries. A few weeks before the term expired the rosh yeshibah permitted the best students to deliver a discourse, in order to familiarize them with the art of delivering a ḥilluḳ. The Talmud was studied in the order of the sedarim. Every rosh yeshibah had a 'shammash' [= "attendant"], whose business was to see that the students in every class attended strictly to their studies. Every Thursday the students were ushered into the presence of the gabbai, who examined them. For failure in the examination the student was sometimes chastised with a rod by the shammash and sometimes admonished in the presence of the other students. In the last days of the term the pupils reviewed what they had learned during the term. When the session ended the students traveled with the rosh yeshibah to the fairs on market-days ["yerid"]: in summer to the fairs of Zaslav and Yaroslav, and in winter to the fairs of Lemberg and Lublin. The students were allowed to choose any yeshibah in those places during the fairs. The gathering of so many students at the fairs, where merchants congregated to sell or purchase goods, was the occasion of making hundreds of marriage engagements; the best students were selected on the recommendation of the rosh yeshibah, and the amount of dowry offered varied according to the student's knowledge of the Talmud and his skill in delivering a ḥilluḳ. Both the students and the rosh yeshibah were held in high esteem by rich and poor alike. The rosh yeshibah received many presents in money and goods; if neither a Kohen nor a Levite, he was entitled to the third portion ["shelishi"] in the order of persons called up to read the sidra. In leaving the synagogue, the rosh yeshibah led the students, who were followed by the people. On Sabbaths and holy days he was visited by the prominent members of the community." Yeshibat Jacob Pereira: Subsidized by Jacob Pereira of Holland; income 1,200 piasters per annum; rosh yeshibah, Ḥakam Meyuḥas b. Samuel, author of "Peri ha-Adamah," aged 53; 30 baḥurim, 3 melamedim. Order of study: each student separately one halakah; in the afternoon same halakah by all together, and also one chapter of Mishnah with commentaries. Yeshibat Neweh Shalom: Supported by Isaac di Mayo & Co. of Constantinople; income 700 piasters; rosh yeshibah, Raphael Moses Bulah, author of "Geṭ Mekushshar," etc. ; 20 students, 2 melamedim. Order of study: in the forenoon halakah; in the afternoon 5 folios of [Di Vida's] "Reshit Ḥokmah," and Ṭur with "Bet Yosef." Yeshibat Yefa'er 'Anawim: Supported by Joseph and Raphael Franco of Leghorn; income 600 piasters; rosh yeshibah, Abraham ibn Asher, etc. Order of study: in the forenoon 3 chapters of Mishnah with commentaries. Yeshibat Ḥesed le-Abraham u-Binyan Shelomoh: Income 1,000 piasters; rosh yeshibah, R. Ẓemaḥ, etc. ; 6 baḥurim. Order of study: in the forenoon 3 hours halakah, in the afternoon 3 hours Ṭur. Yeshibat Dameseḳ Eliezer: Supported by Eliezer Ashkenazi; income 450 piasters; rosh yeshibah, Judah Nabon, etc. ; 8 students. Order of study: all together one halakah lasting 1½ hours; the rest of the day each one studies for himself; on Wednesday the pupils review what they have studied during the past week. Yeshibat Keneset Yisrael: Organized by Ḥayyim ibn 'Aṭṭar and supported by donations from abroad; income 600 piasters; rosh yeshibah, Ḥayyim Mundichi, etc. ; 4 baḥurim. Study: ha-lakah. Yeshibat Mordecai Taluk: Supported by Mordecai Taluk; income 400 piasters; rosh yeshibah, Jonah Nabon, etc. ; 4 baḥurim. Yeshibat Abraham Meyuḥas: income 1,000 piasters; rosh yeshibah, Meïr Sornaga, etc. ; 5 baḥurim. Study: halakah 7 hours daily. Midrash ha-Ḥasidim: Rosh yeshibah, Shalom Sherebi, etc. Among the rabbis was Abraham ha-Kohen Eskir, who never let midnight pass without study, and who studied all night on Sabbaths and holy days. Three other yeshibot were composed of laymen ("ba'ale battim"), who studied the Bible, Mishnah, and Musar (ethics). The Midrash ha-Ḥasidim is now called "Bet El," and is a congregation of cabalists who study the Zohar and the works of Luria. The other yeshibot of the Sephardim are still subsidized by individual donors abroad. 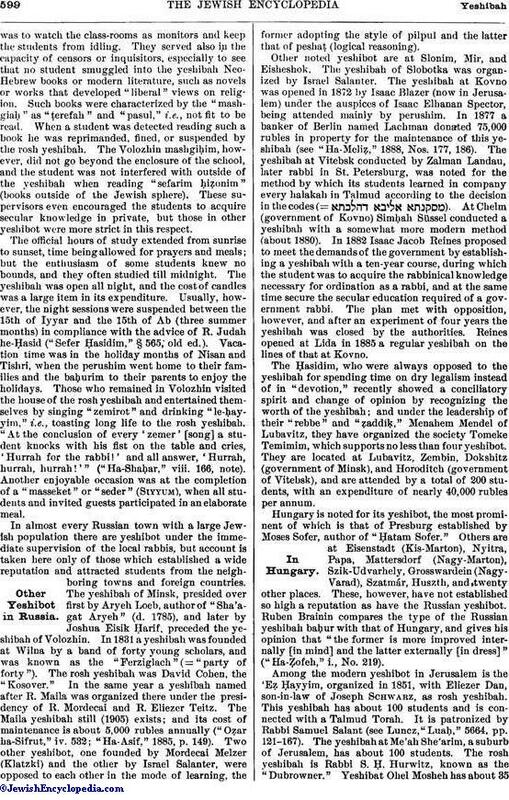 The yeshibot of the Ashkenazim were not established before the latter part of the nineteenth century. The drift of the Reform movement in Germany from the time of Mendelssohn, when the need of secular knowledge became apparent, caused the gradual decline of the yeshibot, until they werepartly replaced by the rabbinical and theological seminaries. There is now no trace of the great yeshibot in France or elsewhere in western Europe. When civil rights were granted to the Jews by France in 1831 there remained only the yeshibah in Metz, officially named "Collège Rabbinique," which, like all other religious institutions, was supported out of the public budget. The yeshibah still existed in Bohemia and Moravia, but had lost many of its former characteristics. The Reform movement on one side and the ensnaring Ḥasidic tendencies on the other caused the pupils of the Wilna Gaon to deliberate how they might preserve the true Jewish learning and perpetuate the method and style of study inaugurated by the Gaon, who was rather opposed to pilpul and the ḥilluḳim as practised in the yeshibot of Poland. With this aim, R. Ḥayyim, the chief disciple of the Gaon, organized in 1803 the celebrated yeshibah of Volozhin, a small town in the government of Wilna, and his own birth-place. His chief object was to make the students independent of private charity; and, being a merchant and possessing considerable wealth, he provided at first for the comfort of the students out of his own means, maintaining some at his table and paying for the board and lodging of others. He started with ten students, and when the number became too large for his means, he issued appeals for assistance to the neighboring communities, which were promptly responded to. At the time of his death in 1828 the number of students was about 100. The yeshibah was continued under the leadership of his son R. Isaac and his son-in-law R. Hillel; and in 1854 Naphtali Ẓebi Berlin, a son-in-law of R. Isaac, succeeded to the position of rosh yeshibah of Volozhin. The Maskilim advocated the introduction into the yeshibah of secular sciences and modern methods of pedagogy; and the attention of the government having been drawn to the matter, it decided to close the yeshibah in 1879. Two years later Berlin succeeded in inducing the government to revoke the edict, and reopened the yeshibah, which he conducted with renewed energy till 1891; it was then closed again by the government, which accused some of the students of having joined the revolutionary movement. After Berlin's death in 1893 the yeshibah was reopened under the management of Joseph Baer Soloveichik. At present (1905) there are about 200 students, and the rosh yeshibah is Raphael Schapiro. Under the leadership of Berlin the Volozhin yeshibah attained its highest efficiency, having nearly 400 students, among whom were about 60 perushim. The cost of its maintenance was about 40,000 rubles annually, which sum was collected by meshullaḥim in Russia and America. Poor and rich students alike flocked to this yeshibah from all parts of Europe and even from America. The rich students simply followed the advice of the Mishnah: "Wander forth to a home of the Torah" (Ab. iv. 18). 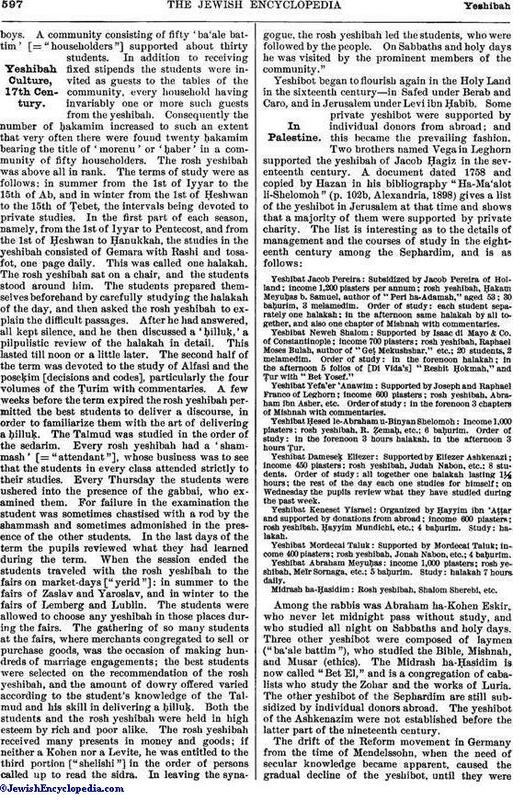 Those students who received a regular allowance from home and paid their own expenses were known as "köstnikers" (= "easy boarders"), while the poor students who depended on the weekly allowance of the ḥaluḳḳah from the yeshibah fund were called "wochernikers" (= "weeklies"). The amount ranged from 60 to 75 copecks per week for the baḥurim, and from 2 to 3 rubles per week for the perushim, who sent about two-thirds of the allowance home to support their families. A special fund created by Brodsky draws an income which provides 20 perushim with 4 rubles each per week. Books were furnished free by the yeshibah. The small stipend was not sufficient to provide food, lodging, and clothing for the indigent students, and the majority of them were obliged to lodge in the class-rooms of the yeshibah or its annex, sleeping on the floor, on the seats, or on the tables in both summer and winter, and having as bedding sacks of straw seldom furnished with linen. They endured great privation, as described in the injunction: "Eat a morsel of bread with salt, drink water by measure, sleep upon the ground, and live a life of tribulation whilst thou toilest in the Torah" (Ab. vi. 4). Some students were invited to board free one day in the week in the houses of the charitably disposed. In fact, the charitable spirit of the town was remarkable; the poorest washer-woman deemed it her duty to give board to one or two students systematically during one or two days a week, and there was hardly a Jewish family in the town that did not shelter in its house one or more students every night, these lodgers taking regular turns one night a week. The days for free lodging were called in the yeshibah vernacular "eating days." The students in the yeshibah were grouped according to the cities whence they came. Thus one would be known as "Itzel der Kovner" (Isaac of Kovno) and another as "Getzil der Warsawer." Some received the title "'illui" (= "the excellent") or "matmid" (= "diligent student"), such a one being known, for example, as "Der Kovner 'Illui" or "Der Lomzer Matmid," assuming that only one from a town was so designated. The title was given by the general consent of the students. They studied singly or in pairs, there being no classes in the general sense of the term; the single pupils or pairs studied according to their grade of learning, asking explanations of difficult passages from those of a higher grade or from the rosh yeshibah. Nearly all studied the Talmud and posḳim, and more especially the laws relating to civil and religious matters in common practise. The Haggadah of the Talmud was excluded from their studies. The only occasion on which the students were together was when the rosh yeshibah delivered his lecture, called "shi'ur," for a certain "sugya" (lesson) on a halakic subject, which lasted about two hours; after this the students discussed the subject among themselves and with the rosh yeshibah. This generally took place in the afternoon session, but sometimes the assistant rosh yeshibah delivered a similar lecture in the forenoon. The rest of the session was spent in studying the subject of the shi'ur beforehand, or in private study. Sometimes the rosh yeshibah would call in to see if the students attended to their studies. Besides there were "mashgiḥim" (supervisors), whose dutywas to watch the class-rooms as monitors and keep the students from idling. They served also in the capacity of censors or inquisitors, especially to see that no student smuggled into the yeshibah Neo-Hebrew books or modern literature, such as novels or works that developed "liberal" views on religion. Such books were characterized by the "mashgiaḥ" as "ṭerefah" and "pasul," i.e., not fit to be read. When a student was detected reading such a book he was reprimanded, fined, or suspended by the rosh yeshibah. The Volozhin mashgiḥim, however, did not go beyond the enclosure of the school, and the student was not interfered with outside of the yeshibah when reading "sefarim ḥiẓonim" (books outside of the Jewish sphere). These supervisors even encouraged the students to acquire secular knowledge in private, but those in other yeshibot were more strict in this respect. The official hours of study extended from sunrise to sunset, time being allowed for prayers and meals; but the enthusiasm of some students knew no bounds, and they often studied till midnight. The yeshibah was open all night, and the cost of candles was a large item in its expenditure. Usually, however, the night sessions were suspended between the 15th of Iyyar and the 15th of Ab (three summer months) in compliance with the advice of R. Judah he-Ḥasid ("Sefer Ḥasidim," § 565, old ed.). Vacation time was in the holiday months of Nisan and Tishri, when the perushim went home to their families and the baḥurim to their parents to enjoy the holidays. Those who remained in Volozhin visited the house of the rosh yeshibah and entertained themselves by singing "zemirot" and drinking "le-ḥayyim," i.e., toasting long life to the rosh yeshibah. "At the conclusion of every 'zemer' [song] a student knocks with his fist on the table and cries, 'Hurrah for the rabbi!' and all answer, 'Hurrah, hurrah, hurrah!'" ("Ha-Shaḥar," viii. 166, note). Another enjoyable occasion was at the completion of a "masseket" or "seder" (Siyyum), when all students and invited guests participated in an elaborate meal. In almost every Russian town with a large Jewish population there are yeshibot under the immediate supervision of the local rabbis, but account is taken here only of those which established a wide reputation and attracted students from the neighboring towns and foreign countries. The yeshibah of Minsk, presided over first by Aryeh Loeb, author of "Sha'agat Aryeh" (d. 1785), and later by Joshua Eisik Ḥarif, preceded the yeshibah of Volozhin. 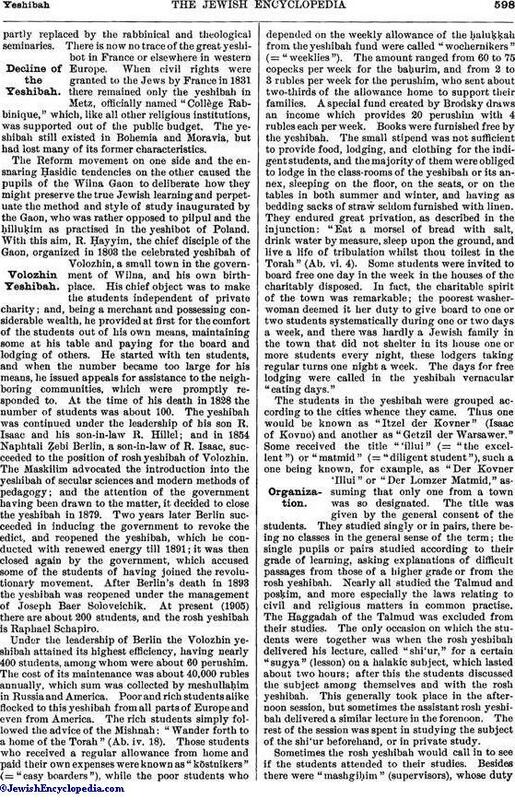 In 1831 a yeshibah was founded at Wilna by a band of forty young scholars, and was known as the "Ferziglach" (= "party of forty"). The rosh yeshibah was David Cohen, the "Kosover." In the same year a yeshibah named after R. Maila was organized there under the presidency of R. Mordecai and R. Eliezer Teitz. The Maila yeshibah still (1905) exists; and its cost of maintenance is about 5,000 rubles annually ("Oẓar ha-Sifrut," iv. 532; "Ha-Asif," 1885, p. 149). Two other yeshibot, one founded by Mordecai Melzer (Klatzki) and the other by Israel Salanter, were opposed to each other in the mode of learning, the former adopting the style of pilpul and the latter that of peshaṭ (logical reasoning). Other noted yeshibot are at Slonim, Mir, and Eisheshok. The yeshibah of Slobotka was organized by Israel Salanter. The yeshibah at Kovno was opened in 1872 by Isaac Blazer (now in Jerusalem) under the auspices of Isaac Elhanan Spector, being attended mainly by perushim. In 1877 a banker of Berlin named Lachman donated 75,000 rubles in property for the maintenance of this yeshibah (see "Ha-Meliẓ," 1888, Nos. 177, 186). The yeshibah at Vitebsk conducted by Zalman Landau, later rabbi in St. Petersburg, was noted for the method by which its students learned in company every halakah in Talmud according to the decision in the codes (= ). At Chelm (government of Kovno) Simḥah Süssel conducted a yeshibah with a somewhat more modern method (about 1880). In 1882 Isaac Jacob Reines proposed to meet the demands of the government by establishing a yeshibah with a ten-year course, during which the student was to acquire the rabbinical knowledge necessary for ordination as a rabbi, and at the same time secure the secular education required of a government rabbi. The plan met with opposition, however, and after an experiment of four years the yeshibah was closed by the authorities. Reines opened at Lida in 1885 a regular yeshibah on the lines of that at Kovno. The Ḥasidim, who were always opposed to the yeshibah for spending time on dry legalism instead of in "devotion," recently showed a conciliatory spirit and change of opinion by recognizing the worth of the yeshibah; and under the leadership of their "rebbe" and "ẓaddiḳ," Menahem Mendel of Lubavitz, they have organized the society Tomeke Temimim, which supports no less than four yeshibot. They are located at Lubavitz, Zembin, Dokshitz (government of Minsk), and Horoditch (government of Vitebsk), and are attended by a total of 200 students, with an expenditure of nearly 40,000 rubles per annum. Hungary is noted for its yeshibot, the most prominent of which is that of Presburg established by Moses Sofer, author of "Ḥatam Sofer." Others are at Eisenstadt (Kis-Marton), Nyitra, Papa, Mattersdorf (Nagy-Marton), Szik-Udvarhely, Grosswardein (Nagy-Varad), Szatmár, Huszth, and twenty other places. These, however, have not established so high a reputation as have the Russian yeshibot. Ruben Brainin compares the type of the Russian yeshibah baḥur with that of Hungary, and gives his opinion that "the former is more improved internally [in mind] and the latter externally [in dress]" ("Ha-Ẓofeh," i., No. 219). Among the modern yeshibot in Jerusalem is the 'Eẓ Ḥayyim, organized in 1851, with Eliezer Dan, son-in-law of Joseph Schwarz, as rosh yeshibah. This yeshibah has about 100 students and is connected with a Talmud Torah. It is patronized by Rabbi Samuel Salant (see Luncz, "Luaḥ," 5664, pp. 121-167). The yeshibah at Me'ah She'arim, a suburb of Jerusalem, has about 100 students. The rosh yeshibah is Rabbi S. Ḥ. Hurwitz, known as the "Dubrowner." Yeshibat Ohel Mosheh has about 35students, and Jacob Urnstein is its rosh yeshibah. It was founded by R. Diskin. The principal yeshibah is the Torat Ḥayyim, with about 150 students, and Isaac Winegrad as rosh yeshibah. The Sephardim maintain the Tif'eret Yerushalayim and other private yeshibot. The yeshibah system was transplanted in America by the Russian immigrants. The first yeshibah, 'Eẓ Ḥayyim (Talmudical academy), was organized in 1886 in New York, and owns its school property at 85 Henry street. Its general expense is $5,000 per annum, and the average attendance about 175 students, with 6 melammedim teaching as many classes; namely, 2 for Ḥumesh (Pentateuch) and 4 for Talmud, consisting of the three Babot (B. Ḳ., B. M., B. B.) with Rashi. The hours of study are from 9 A.M. to 12 M. and from 1 to 4 P.M. for Hebrew, and from 4 to 6 P.M. for English secular subjects. Saturday is review day for the Hebrew studies of the week. The course of study requires from three to four years. Yeshibat Rabbenu Jacob Joseph, located at 197 Henry street, New York, was organized in 1902. The president and general superintendent is Samuel Isaac Andron, and the principal R. Meïr Hecht. There are about 250 students, with 8 teachers and as many classes, including 2 in English and 2 in Talmud. Hebrew studies last from 8.30 A.M. to 12 M. and from 1 to 3.30 P.M.; English studies from 4 to 7 P.M. The course occupies three years. The English students are prepared for entrance examinations for public grammar-school and college. The most important yeshibah in New York is Yeshibat Rabbi Isaac Elhanan (Theological Seminary Association), organized in 1897 and located at 156 Henry street. It has about eighty students, ranging in age from thirteen to twenty-three. Dr. Philip (Hillel) Klein is president, and Nahum Dan Barhon is mashgiaḥ, with Moses Löb Schapiro as rosh yeshibah and Solab and Hirschberg as his assistants. Each student receives a stipend of $3 per week and clothing; expenditure about $15,000 per annum. The Talmud and poseḳim are the only subjects taught there, chief attention being given the treatises of the three Babot, Giṭṭin, Ketubot, and Ḳiddushin. Of the Shulḥan 'Aruk only Yoreh De'ah, Ḥoshen Mishpaṭ, and Eben ha-'Ezer are studied. After a course of three or four years the graduates receive semikah. One of the graduates, Naphtali Rosenberg, was elected rabbi of Syracuse, N. Y. This yeshibah is planned on the model of that of Volozhin. Other yeshibot of less importance are in Boston, Philadelphia, Pittsburg, and Chicago. The advocates of the yeshibah system contend that it is still necessary to produce a true rabbinical training. Thus Isaac Hirsch Weiss says that it requires at least ten years of diligent study, and scrupulous and strict examination, before the hattarat hora'ah is issued to a candidate. Weiss admits, however, the need for a modern rabbi to be familiar with modern knowledge and literature ("Zikronotai," pp. 73-83). Isaac Rabbinowitz, the Hebrew poet, remarks that experiments with the Rabbinerschule in Wilna and Jitomir have proved the impossibility of producing in the modern schools of learning acceptable rabbis for the old-fashioned Russian congregations ("Ha-Kerem," p. 33, Warsaw, 1887). See Talmud Torah. Ha-Shaḥar, viii. 112, 119, 161. 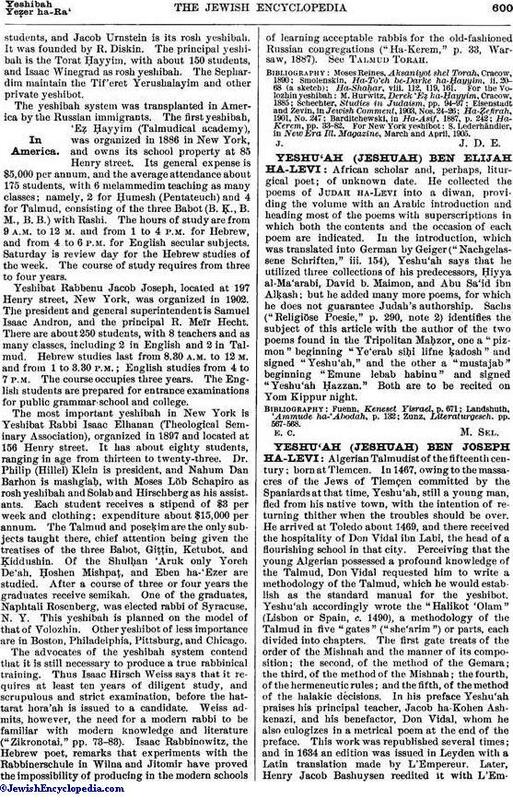 For New York yeshibot; S. Lederhändler, in New Era Ill. Magazine, March and April, 1905.